Identification: The brown trout is primarily a freshwater fish, but can adapt to salt water. The fish can grow to 10lbs or 102 centimeters and is noted for its fast growth rate. The brown trout’s preferred habitats are streams, lakes or brooks. The brown trout has an olive or brown colored body and dark brown or red spots. The tail is square with few or no spots on it. The ideal temperature for the brown trout is 56◦F and 66◦F. Notably, the brown trout can survive in water that may be too warm for other trout species, such as the brook trout. The trout matures in 3 to 4 years. Females spawn in the fall, producing 10,000eggs. Juvenile brown trout feed on insects or other invertebrates, but as the trout matures, they also eat other fish. Original Distribution: The original distribution of the brown trout is documented to be Europe, North Africa and Western Asia. Several specific countries that have been cited as native for the brown trout include the European countries of Ireland, Iceland, Sweden, Germany, France and Greece. Native Western Asian countries are cited as Armenia, Afghanistan and Turkey. Current Distribution: Brown trout are now found globally. Brown trout introductions have been cited in North and South America, Australia, Africa and Asia. In the United States, almost all the states including Hawai’i and even Puerto Rico have documented incidences of brown trout. Brown trout has been introduced in 45 of the 50 states, with a self-sustaining population in 34 states. In the Northeastern United States, brown trout are found in Rhode Island, Connecticut, Maine, Vermont, New Hampshire, New York and Massachusetts. Other countries into which the species have been introduced include Argentina, Bolivia, Chile, Ecuador and Colombia in South America as well as Madagascar, Malawi and Tanzania in Africa. In Asia, the fish has been introduced in India, Sri Lanka, Papua New Guinea and Nepal. Site and Date of Introduction: Aquaculture and fish stocking are the primary means of introduction of the brown trout to new areas. In the mid-1800’s, brown trout aquaculture was established in Europe. From this aquaculture, brown trout were introduced into European colonial areas, a practice that has been called “ecological imperialism” by Alfred Crosby. In this way, brown trout were introduced into the English colonial areas of India, Australia, and New Zealand throughout the 1800’s. The first introduction of the brown trout into the United States was by the US Fish Commission in 1883 in Michigan State. In Michigan, brown trout eggs were raised at the Northville hatchery. The fish were then released into the Pere Marquette River in the Northern area of the state. In addition, in 1883 the fish was also introduced into New York State through the Caledonia Fish Hatchery. Mode(s) of Introduction: According to Peter Bryant in “Biodiversity and Conservation,” the practice of aquaculture or “fish farming” is one of the leading contributors to invasive species. Bryant references Mozambique Tilapia as well as salmon farms as sources of invasive species. In addition, the diseases and viruses of these species are being introduced into new areas. As noted above, brown trout has primarily been introduced as a result of aquaculture and fish stocking. The goal of these activities was to support recreational fishing. Reason(s) Why it has Become Established: The brown trout is able to live and grow in warmer waters than other native trout species, such as the brook trout. As such, the brown trout has been able to establish itself in many areas in which brook trout cannot exist or where warmer waters exist. Given changes temperatures and climate change, it will be interesting to understand what implications, if any, this has on the changing trout species in a given area. The brown trout also grows faster and can be bigger than native species, such as the brook trout. Therefore, in certain areas, brown trout can outcompete brook trout and other native species. The food which brown trout eat, primarily insects, mollusks and smaller fish, is also widely available and do not constrain the growth of the trout. Ecological Role: Brown trout has an ecological role in the biodiversity of rivers, lakes and streams. As brown trout play an important role in the food chains of these areas, it impacts small fish, mollusk and insect populations of its prey. Competition with other species contributes to changing fish populations, impacting the biodiversity of an area. In addition, because brown trout is adaptable to warmer water, it especially changes the biodiversity in warmer lakes and streams. Benefit(s): The brown trout is popular with recreational fishing communities. The ability of the brown trout to adapt to warmer areas than brook trout and their larger size has made them popular with fisherman. Because of their growth rates, these fish are also said to be able to withstand greater fishing pressure than other species. In addition to aquaculture and recreational fishing, brown trout also serve as an aquarium species. There are significant economic benefits to trout as well. The annual US trout industry was almost $80m in 2001. Threat(s): Because brown trout is more adaptable than brook trout, in some areas, they are considered to outcompete native trout species. Brown trout has been cited as reducing native species through predation. It also displaces other species and contributes to increased competition for food. There have been several studies that have analyzed the impact of brown trout on other trout species, specifically the brook and golden trout. While juvenile brook trout can outcompete brown trout, there is significant evidence of brown trout displacing adult brook trout as the competition between the species changes over the lifetime of the fish. New York State has experienced significant declines in the brook trout population since the 1960’s. In addition, to displacing trout species such as brook trout or golden trout, there is evidence that brown trout has displaced or preyed on other species of fish including the Modoc Sucker, depleting these populations. In addition, there has been evidence that the brown trout is able to mate with native species. This can result in changing genetic make up of the trout species. Control Level Diagnosis: Medium. While brown trout provides benefits to recreational fisherman and economic benefits to the fishing industry overall, the impact on native species trout population and other species is considerable. Managing these populations and new introductions is an important control measure. Control Method: There are several ways in which brown trout are being controlled. One way in which New York State is attempting to address brown trout as an invasive species is to implement programs supporting the native brook trout. Studies to analyze the depletion of native brook trout species have focused on water quality and understanding the native species’ genetic strains. Conservation programs have been implemented to preserve the brook trout populations. These programs include brook trout pond reclamation, improvement in water quality and reforestation of watersheds. 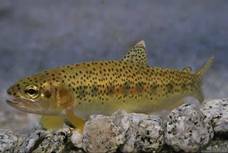 In California, there have been attempts conserve the native Californian golden trout and eliminate brown trout. In Australia, brown trout and other invasive species are being tackled with regulations that limit the amount of introduced species in rivers and lakes. Bryant, Peter, 2002,“Biodiversity and Conservation: A Hypertext Book” 2002. 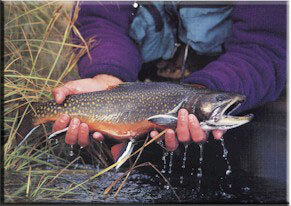 Cornell University, “Fish Management of New York State: Conservation of Brook Trout in Northern Lakes” http://fish.dnr.cornell.edu/trout.htm. Accessed November 2006. Fornshell, Gary and Jeffrey M. Hinshaw, “US Trout Industry” University of Idaho and North Carolina State University. Powerpoint Presentation. Global Invasive Species Database, “Salmo Trutta (fish)” http://www.invasivespecies.net/database/species/ecology.asp?si=78&fr=1&sts=sss Accessed November 2006. Illinois State Department of Natural Resources, “Illinois Exotic Species: Salmo Trutta” http://dnr.state.il.us/LANDS/EDUCATION/EXOTICSPECIES/browntrout.htm Accessed November 2006. Integrated Taxonomic Information System website, http://www.cbif.gc.ca/pls/itisca/taxastep?king=every&p_action=containing&taxa=Salmo%20trutta. Accessed November 2006. United States Geographical Survey, “Nonindigenous Aquatic Species: Salmo Trutta,” http://nas.er.usgs.gov/queries/collectioninfo.asp?NoCache=11%2F13%2F2006+5%3A15%3A16+PM&SpeciesID=931&State=NY&HUCNumber= Accessed November 2006.